Victoria is the beautiful capital of British Columbia, Canada and is named after Queen Victoria of Great Britain. The city is very famous for the variety of things it offers to the tourists. Whether you are up for some shopping or visiting museums, want to take a stroll in parks or want to experience the adventure of whale watching, Victoria City offers something for all the tourists. You can’t sit freely while you are in Victoria. There are a number of things to do in Victoria, British Columbia. 1) China town: Founded in 1858, it is the perfect place to learn about the Chinese heritage of Canada and the rich cultures that are still alive here. This place is a living museum. You can also see Canada’s narrowest street Fan Tan alley here in China town. There are a number of restaurants, bars, cafes and amazing shops and boutiques with awesome fashion sense. It is a perfect place to relax and enjoy. 2) Inner Harbour: It is the heart of Victoria. The famous water ballet is performed here every Sunday during summers by the Ferris. Apart from the boats, this place also has the city’s well known landmarks like the Royal BC museum, Empress Hotel and the Parliament Buildings. You sure don’t want to forget your camera while visiting this place. 3) Whale Watching: A three hour tour in the boat to watch beautiful creatures, giant whales and panoramic views of the sea is something unique to do. This chance of getting close to the wildlife of the sea is not worth missing. 4) Fisherman’s Wharf: If you are up for some fun and fishing, than this is the right place for you. Feed seals, do fishing and see the beautiful and colourful boathouses that float freely on the sea. This place brings fun and adventure. 5) Butchart Gardens and Butterfly Gardens: If you want to be close to the nature, than these gardens are a perfect place for you to visit. 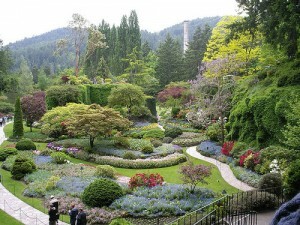 Butchart Gardens are almost 100 years old and present all the beauty of nature that is there. You can use pathways to walk in the garden and relax around the splendid beauty of the rose garden, the Japanese garden and sunken garden. Visit it on Christmas if you can for some magic. Butterfly Garden is an amazing experience to praise the beauty of exotic butterfly species with vibrant colours. This garden holds hundreds of species of butterflies along with some exotic tropical plants, orchids, birds, tropical ducks and fish. You can learn all about the butterflies and their lifecycle here. Waterfalls in this garden will give you an impression of a tropical forest. 6) Miniature World: It has the world’s biggest dollhouse and has the longest model railroad of the world. This is something like you have never seen before. The exhibits of famous battles, stories and landscapes are created here at a miniature level. This world explains the history of Canada through miniature display. There is so much to do and to see in Victoria, British Columbia that words can’t be enough. So take your time and discover the world beyond your imagination.